Diffuse large B-cell lymphoma usually starts as a rapidly growing mass in an internal lymph node and can grow in other areas such as the bone or intestines. About 1/3 of these lymphomas are confined to one part of the body when they are localized. In the case of a 78-year-old man, an extensive tumour was located on the right thigh. Biopsies of the tumour revealed diffuse proliferation of large lymphoid cells which have totally affected the normal architecture of striated muscle. The patient received multimodality treatment including chemotherapy of the CHOP regimen and adjuvant radiotherapy. Despite this being a fast growing lymphoma, about 3 out of 4 people will have no signs of disease after initial treatment, and about half of all people with this lymphoma are cured with therapy. A 78-year-old man presented to our hospital with an extensive tumor located on the right thigh (Figure 1A-B). A, B: MRT of the right thigh, transversal scan T1 and T2 respectively. C: HE-staining of a diffuse proliferation of large lym phoid cells which have totally affected the normal architecture of striated muscle. D: The neoplastic cells express pan-B-cell markers such as CD 20. The patient reported that he had been treating the fast growing tumor with complementary medicine for 6 weeks prior to consulting our hospital. 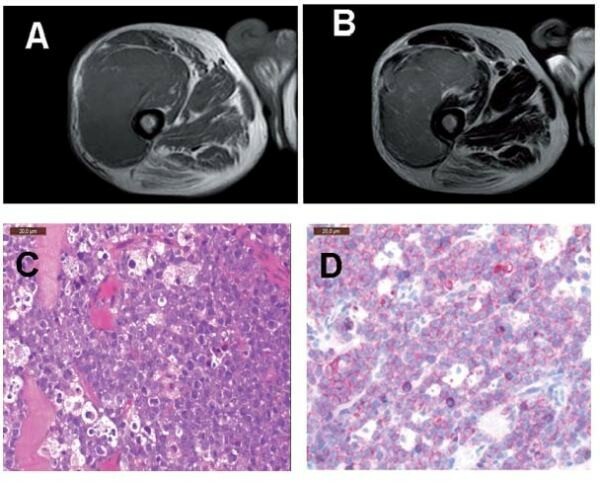 Histopathological examination of a biopsy revealed diffuse proliferation of large lymphoid cells which have totally affected the normal architecture of striated muscle (Figure 1C-1D). The medium- to large sized neoplastic cells expressed pan B-cell markers such as CD 20 corresponding to an extra nodal diffuse large B-cell lymphoma. Further screening diagnostics revealed an uni-localized tumour restricted to the right thigh. Our patient received multimodality treatment including chemo therapy of the CHOP scheme and adjuvant radiotherapy. Diffuse large B-cell lymphoma (DLBCL) can affect any age group but occurs mostly in older people. It usually starts as a quickly growing mass in an internal or superficial lymph node and can infiltrate other areas such as the intestine, bone, or even the brain or spinal cord. About 1 out of 3 of these lymphomas is confined to one part of the body when it is found. Localized lymphomas are easier to treat than when they have spread to other parts of the body. There are different genetic subtypes of DLBCL, even though they look the same under the microscope. These subtypes seem to have different prognoses and responses to treatment. This is a fast growing lymphoma, but it often responds well to treatment with radio-chemotherapy. Overall, about 3 out of 4 people will have no signs of disease after initial treatment, and about half of all people with this lymphoma are cured with therapy [1–4]. This work is dedicated to Roland Radner.